Massachusetts is dealing with one of the worst droughts in its history, with widespread water restrictions and shortages. But the artificial turf industry is taking advantage of this rough patch, and more cities are considering fake grass as an alternative. "I was kind of concerned it would look kind of fake," said Kellie Condon, who initially had doubts. Condon and her husband, William, installed artificial turf in their back yard a few months ago, and now they're believers. "The downside, I couldn't really tell you," William said. 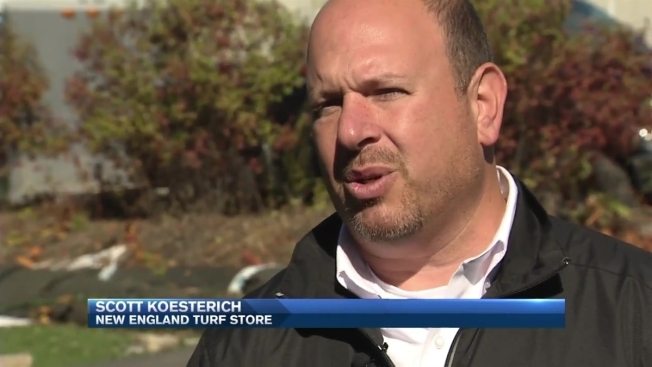 New England Turf Store President Scott Kosterich, and others in the artificial turf industry, are seeing green. "Probably a 200 percent increase in our sales," said Kosterich. His company primarily installs turf on playing fields. Now, he's also selling more to homeowners considering this as an option. "They don't have to put in irrigation, they don't have to put in chemicals," Kosterich said. Boston, Worcester, Norwell, and Scituate have already either put in artificial turf in public places or are considering it. However, this stuff isn't for everyone, like Al Sbordone. "It's not going to be real," he said. "It will be real plastic." There's also concern artificial that since turf doesn't give off oxygen for the atmosphere and on hot days, the surface can get toasty. It can also be pricey, depending on the quality and size. The Condons paid $10,000 for their backyard at around $3 a square foot. And without all their neighbors on board, they've left their front lawn all natural -- just in case. "I don't think an artificial lawn would jive with them just yet," William said. An industry group is launching a major campaign, lobbying cities and towns in Massachusetts to give rebates for home owners who install the artificial turf, just like some communities in California, also dealing with a drought.